Great maintenance service from Daniel! "We had a leaky sink, and were told we'd have to wait until tomorrow to get it repaired. Daniel found the piece of hardware needed for the repair and made a point to come back so that we could get our sink fixed today. Great job to him and thank you!" "Chuck visited my apartment this morning to check the leak on my garbage disposal and fix the caulking on my tub. He was very pleasant during the entire visit and did a wonderful job. He replaced my garbage disposal and measured the area under the disposal for particle board to repair the hole later this week. I look forward to seeing him again. Thank you Chuck." "When my roommate and I visited Glencoe Hills to look into renting, Amanda gave us the BEST customer service. After the first apartment we looked at fell through, she searched through the complex and took us to a number of other available flats until we found just the right one. She was patient and caring to two girls completely new to renting, and paid attention to our needs and desires. She stayed late to finish the contract with us, and helped us figure out some tricky details. We really felt that she cared about us as persons and not just tenants. Thank you, Amanda!!" "Todd visited me last week to check on a list of potential apartment problems. He was very polite and helpful. He returned today and fixed my drawer and garbage disposal for me. He also gave me some advice on who to contact with other issues I might have. It was a wonderful experience. Thank you Todd." "I had been having a lot of issues in the short time we have lived here. I am absolutely blown away by the level of care Amanda showed to get things handled fast and correctly. Absolute dedication to her job and to the comfort and care of the residents. I cannot thank her enough. Chuck also took care of everything and is a pleasure to deal with. Great guy, fun and highly skilled. Thanks guys for handling our problems above and beyond. We really appreciate your help. " Thanks to Shauna and Chuck! "Both Shauna (in management) and Chuck (in maintenance) did an outstanding job in addressing a recent service request. Both were professional, cheerful, and helpful throughout the process and they each took extra time out of their day to address the issue. Thanks to both of you for the extra effort!" 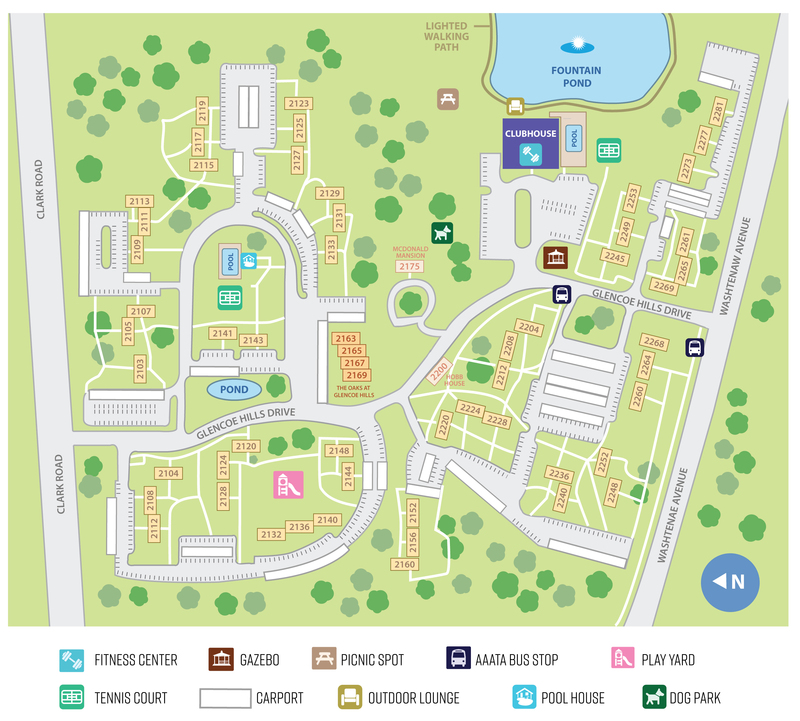 Glencoe Hills Apartments located in Ann Arbor, Michigan rests on a little over 65 acres. We are conveniently only minutes away from the University of Michigan - Ann Arbor campus and hospital, Eastern Michigan University, Washtenaw Community College and St. Joseph's Mercy. Our community offers one, two- and three-bedroom apartments. Each apartment comes with an intercom entry system, spacious closets, central heat and air and a fully equipped kitchen including; disposal, dishwasher and refrigerator. The grounds at Glencoe Hills are beautiful, where you will find two swimming pools, two tennis courts, pet-friendly lit nature trails, picnic areas, a playground and so much more. Our fully equipped 24-hour fitness center, beautiful fireplace, big-screen TV, full service kitchen and wet bar can all be found in our cozy two story clubhouse. We are less than a mile from US 23, and you'll have easy access to 1-94 and M-14 keeping you around the corner from world class dining, shopping, and cultural facilities offered in downtown Ann Arbor and Ypsilanti.